-- Select a Size/Color -- X-Small - Out of Stock! Small Medium - Out of Stock! Large - Out of Stock! X-Large - Out of Stock! Take home the prize for the cutest costume with the Walking Teddy Bear Dog Costume this Halloween! 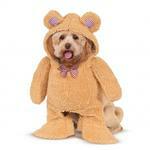 Everyone will want to cuddle up with this fun and furry Walking Teddy Bear Dog Costume. This one-piece costume with attached hoodie is sure to be a hit this Halloween or at any of your costume parties year round. This adorable costume features ultra plush furry fabric to help your pet be cozy and irresistible. The brown check fabric ears and bowtie offer country charm to this classic look. To apply, simply have your pet put their head into the hood from the back and secure it with the touch fastener at the neck. Use the drawstring opening to keep the hood secure around your pet's face. Next, insert your pet's front legs into the feet of the teddy bear costume. 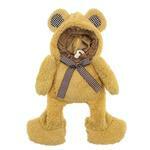 The stuffed bear arms will jiggle as your pet walks around for a fun animated look that will get your pup noticed! Because the back of the costume is open, your pet will find this to be a comfortable outfit for Halloween. 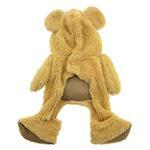 It would also be fun for your pet to wear at a teddy bear picnic, a child's birthday party, or even a baby shower! Wherever your dog decides to wear this adorable costume, make sure you have the cameras rolling for some fun footage. Your pup will love the attention! Be sure to submit your photos below for a chance for your pet to be our next Pet of the Day. Who knows? Your "beary" cute pet could even win a $250 BaxterBoo.com shopping spree! See photo contest rules for details. Walking Teddy Bear Dog Costume Customer Photos - Send us your photo! We always say that Boomer is our big teddy bear so what better Halloween costume could we have found? Don’t let his face fool you...he loves dressing up! Teddy, the teddy bear and his teddy bear friends !! Just got the Teddy bear outfit everybody LOVES it!! Posted On 10/26/18 by Laurel I from Port Monmouth, NJ Yes, Laurel I recommends this product! This is by far one of the cutest costumes. Fits well. Posted On 10/12/17 by Judy C from San Rafael, CA Yes, Judy C recommends this product! Cutest costume I've ever had!!! I have a doodle like the one in the picture and he looks just like it. Easy to put on and I would recommend for any dog. Posted On 10/26/16 by Julie S from Apple Valley, MN Yes, Julie S recommends this product! This costume is really easy to put on and adorably cute. Posted On 10/07/16 by Karen B from Wakefield, MA Yes, Karen B recommends this product! The harnesses exceeded my expectations, I am more than pleased with this purchase.